Sakai Community DocumentationSakai 19 User Guide (English) Site InfoHow do I copy my content from one site to another? When you create new Sakai sites, you may want to copy content such as Lesson pages, Resources, Announcements, and Assignments from an older site into your new site. The Import from Site tab in Site Info allows you to select content from one or more tools from an older site and copy the content into the new site. Navigate to new, empty site where you would like to copy the content. Zoom: Sakai page with site tab highlighted for site where content will be copied. Select the Site Info tool in the Tool Menu. Select the Site Info tool from the Tool Menu of your destination or new site. Zoom: Import from Site tab highlighted in Site Info tabs. Click Import from Site from Site Info tabs. Click the "I would like to replace my data" link. Selecting the I would like to replace my data option will transfer your site content, as well as your Gradebook settings. Note that choosing this option can be a destructive process, since existing content in the new course may be overwritten and replaced with your copied content. Tip: If you have existing content that you do not want to overwrite, choose the I would like to merge my data link instead. Select the course you want to copy from. Select the site you want to copy content from from the list of sites. Choose the material you would like to copy. 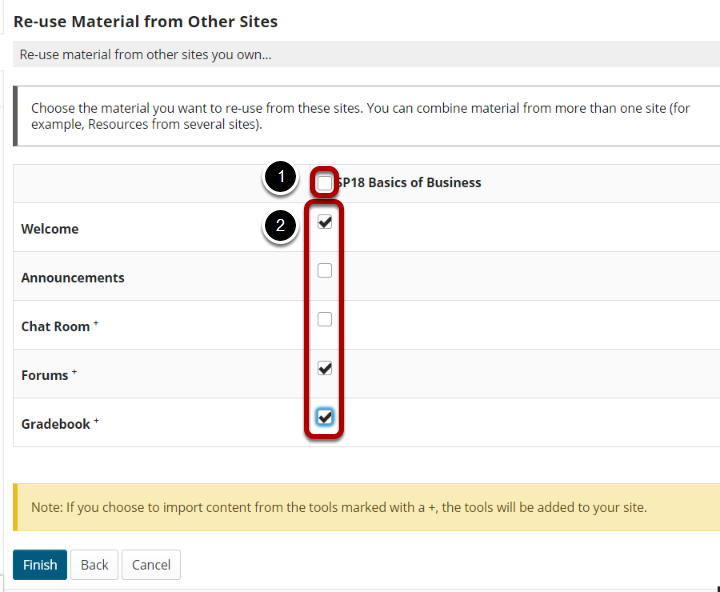 Use the checkbox at the top of the right column to select content from all tools. Alternatively, you can check the boxes to the right of each tool to select specific tools to be copied. If a tool is not active in the current site, the tool will have a + mark to indicate that it will be added to the current site if selected for import. Note: For each tool selected, all of the content for that tool will be copied into the new course. Once you have made your tool selections, click Finish to complete the import. Note: The content import process may take a while depending on how much content you have, or if your institution has a queue for course imports on the server. Please wait for the process to finish. Prev: How do I duplicate a site? Next: How do I import content from an archive file?